Hi my name is Kristie and I would love to tell you more about my story. After landing my dream job as an air hostess for the world-renowned Virgin Atlantic, I thought I had hit the jackpot. Little did I I know that a couple of years later my world would have been turned upside down after being diagnosed with chronic migraines. I lost the job I so deeply loved and my world came crashing down. After trying every form of conventional medicine possible to cure my migraines, including botox, medication, nerve blocks and so much more, I was told by doctors that there was nothing more that they could do for me. I was told I would just have to live with the condition and learn to manage the pain. There was no way that I was going to accept this so I decided that enough was enough and this is when I began my journey to holistically heal myself. I read countless books, learnt to meditate and visualise a healthy future for myself, re-evaluated my beliefs around healing, taught myself about nutrition and how to use food as medicine, learnt about the law of attraction and simply tried to find more balance in my life in order to let my body heal naturally. Through patience, a positive mindset and the courage to step outside of my comfort zone I am now pleased to say that I am now totally chronic migraine free! Along this journey, I found that it ignited a passion inside of me to help others do the same and heal themselves. I want to inspire others that may be suffering and were in the same terrible situation that I was, that healing IS possible, and the key to this is firstly believing that it is possible. I want to share my story with others in hope that it inspires them to keep fighting and look within themselves for the answers. As a result of my new passion for all things health, I qualified as a Health Coach at The Institue of Integrative Nutrition so I am now able to coach, guide and help others begin their own healing journey too. 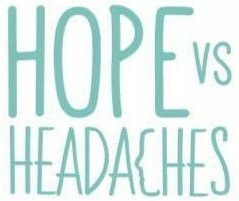 I am now working for an exciting new company Head Health which is going to offer the future of migraine healthcare so more information will follow soon so watch this space…. My name is Allana and I also have chronic migraine for 5 years, like you I have tried everything in the world to heal tham, I am a 80/10/10 (low fat) whole food vegan for 5 years and a higher fat raw vegan for 10 (on and off the raw in Tasmanian cold times) years before that, before becoming a chronic migraineur I was a yoga and meditation practitioner/teacher. Dr Jo’s meditations focus on primarily changing negative emotions, and my big question is – how do we know what emotions in us are leading to the migraines? I have had a full on life… serious abuse as a child for 10 years, the love of my life died of cancer when I was 24 and the migraines started at 27 when after I got back from meditation/yoga for 6 months in India with some very dangerous parasites and then killed most of them with natural and antibiotic remedies then and I moved in with a new partner – which scared me allot after my husband died. So as we have (or at least now I – not you) have a very serious painful condition, we know that we want to live our dreams migraine free, and we can focus on experiencing the emotion of what that would be like. How did you know what emotions you wanted to leave behind? At the moment all I have come up with is – not feeling like a victim when I’m “driving down the road in my car and a migraine starts… and I say change!” and have gratitude for the good things in my life. My very wise friend who has done Dr Jo’s meditations daily for years suggested I focus on letting go of the fear of being with my new partner. Do you have any advice for me wise one?